This scrumptious Organic chocolate frosted diaper cupcake looks delicious and delightful. 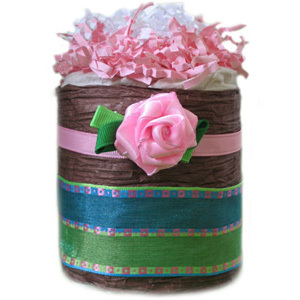 Adorned with a beautiful handcrafted Silk Pink Rose Hair Clip and vibrant ribbon, our diaper cupcakes make a beautiful baby gift on their own, in a set of three or accompanying a matching Chocolate Pink Rose Diaper Pound Cake. Our diaper cupcakes are made with 5 Eco Friendly Diapers (Size 1). (Please choose Seventh Generation or Nature BabyCare).